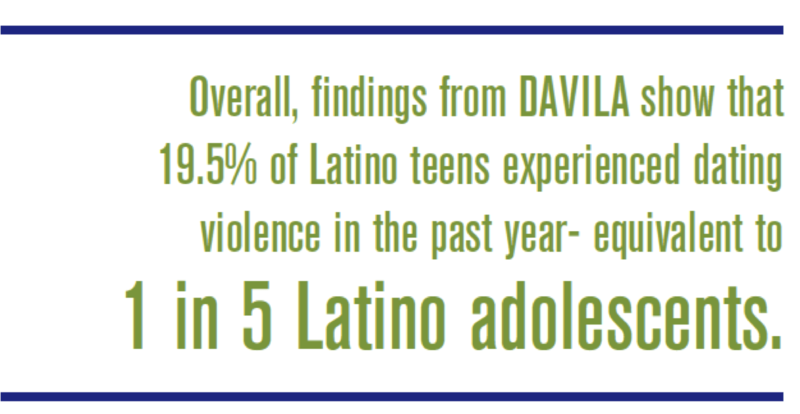 One out of five Latino adolescents experienced teen dating violence according to the the newly released Dating Violence Among Latino Adolescence Study (DAVILA). This National Institute of Justice funded study conducted interviews with a national sample of 1525 Latino adolescents. 6.6% had experienced physical dating violence, 5.6% had experienced sexual dating violence, 1.0% had experienced stalking by a dating partner, and 14.8% had experienced psychological dating violence. …prevention efforts should focus on this form of dating violence and equip youth to identify and confront controlling actions, put-downs and jealously, for example. Shorey (2012) recommends a psychoeducational component focused on psychological aggression and communication skills be included in prevention efforts. These programs should be adapted to the Latino population including language, idioms, how discrimination may play a role in dating violence, and the importance of family. The full report can be found here and a summary of the report is here.